The Avenue of Honour commemorates those from the district who served in World War One. SMYTHESDALE. AVENUE OF HONOR. For several weeks past residents have been busily engaged arranging details in connection with the Avenue of Honor which will be started on Saturday next. 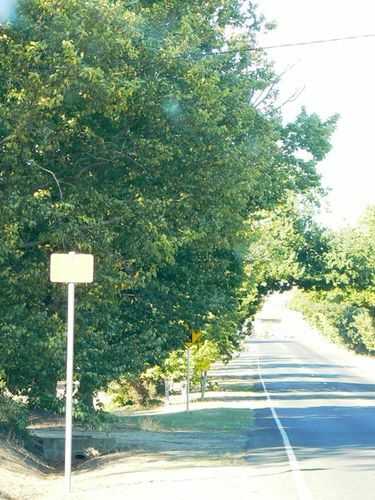 The trees and guards have been received and will be planted due north of the Town Hall on both sides of the road to Ballarat. One hundred trees will be planted, which shows that the township's quota to the A.I.F. compares very favourably with that of other towns. Several of the boys have gained military honors, and many have made the supreme sacrifice. The Mayor of Ballarat (Cr A. Bell), Mr D. C M'Grath. M.P. and Mr Gibson, M.L.A. and other gentlemen have been invited to be present, and the day, given fine weather, promises to be a red-letter one in the history of the township. The State school children and members of the local Fire Brigade and other bodies will assemble opposite Miss Baddely's residence, and will await the arrival of the Highland Pipe Band and party from Ballarat. The band will head the procession and march to the Town Hall, where the speeches will be delivered at the close of which four members of the Macarthur street Scouts Bugle Band will give the signal to begin the tree planting operations. A sum of £23 has been collected locally by the collectors, Mrs H. Willis and Misses M. Dalton, A. Dickson, and L. Fuller. Drags will leave Rennie's stables on Saturday afternoon next, particulars of which are advertised. A meeting of the committee took place on Thursday everning, Cr M'Menamin presiding. The secretary reported that he had made enquiries regarding trees, and Mr Chas. Walker, an old Smythesdale boy, had generously donated about 30 chestnut trees. A vote of thanks was passed to Mr Walker for his kindness. The ladies have promised to supply refreshments for a small charge, the receipts to go to the planting fund. Residents of all the surrounding districts have signified their intention to be present. A working bee will be held today. Ballarat Courier (Vic), 3 August 1918.